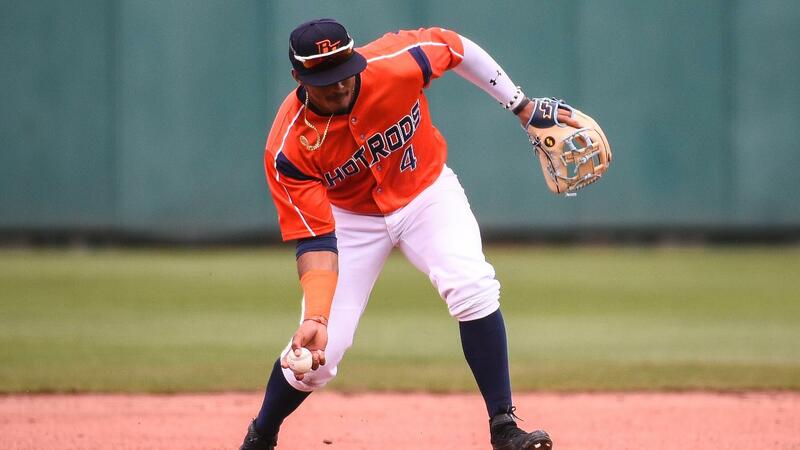 Eastlake, OH- The Bowling Green Hot Rods split a double-header with the Lake County Captains on Tuesday, winning the first game 6-3 while falling in the second game 13-4. The Hot Rods are 3-3 overall and will play the third game of the series on Wednesday with a 5:30 PM CDT first pitch at Classic Park. The Hot Rods took the lead in the second inning of the first game against Captains' starter Alex Royalty. With one out, Connor Hollis singled to right and went to second on a passed ball. Tony Pena walked, and Jake Palomaki singled to right, scoring Hollis to make it a 1-0 game. Michael Smith singled to right, scoring Pena to give Bowling Green a 2-0 advantage. Lake County tied the game in the bottom of the frame against Alan Strong in his first start for the Hot Rods. Josh Rolette worked a one-out walk and went to third when Quentin Holmes reached on an error to deep left-center field. With both runners in scoring position, Ulysses Cantu grounded out to third which scored Rolette to make it a 2-1 game. Marco Gonzalez tied the game with a double to left-center to score Holmes and make it 2-2. The game quieted down, and the Hot Rods retired 16-straight Captains from the end of the second inning through the seventh. It wasn't until the 10th that Bowling Green got to Lake County reliever Dakody Clemmer. With one out, Ford Proctor singled to right, plating Palomaki (who was placed at second to start the inning) and made it a 3-2 Hot Rods lead. Osmy Gregorio singled to left and Chris Betts singled to right, driving in Proctor to give Bowling Green a two-run advantage. Kaleo Johnson grounded into a fielder's choice to score Gregorio and eventually came around when Tony Pena singled to right. The four-run inning gave the Hot Rods a 6-2 lead, eventually winning 6-3 in the first game of the double-header. Strong tossed five innings and allowed two unearned runs on one hit with two walks and seven strikeouts. Nick Sprengel hurled three hitless frames with four strikeouts. Nick Padilla (1-0) earned the win and threw the final two innings, allowing one run while holding the Captains to two hits with a walk and five strikeouts. Game two was close until late in the game. Lake County picked up runs against Hot Rods starter Easton McGee in the first and second innings, but Bowling Green tied the game in the fifth with reliever Brady Aiken on the bump for the Captains. With one out, Smith walked and stole second while Wander Franco followed with a walk of his own. Two wild pitches ended up scoring Smith while Franco was plated thanks to a double by Hollis to tie the game. It didn't last long, though, as Lake County scored nine runs in the bottom of the frame to take an 11-2 lead. Bowling Green scored two more runs in the sixth, but the Captains got them back in the home half of the inning to give Lake County a nine-run advantage. The Captains went on to win 13-4 and split the double-header. McGee took a no decision after hurling 3.1 innings and allowed two runs on five hits with a walk and three strikeouts. Miguel Lara (0-1) took the loss and allowed six runs on three hits with four walks and two strikeouts. Chris Gau didn't register an inning but walked two and allowed two to score after four wild pitches. Hollis threw the final 1.1 innings and allowed three runs on three hits with a strikeout. Notes: Betts had his third multi-hit game of the season and extended his personal hit streak to three games… Gregorio had his second multi-hit effort of the year… Strong set a new career-high with five innings… His seven strikeouts tie a career-high for the third time… The Hot Rods tied a season-high with 16 strikeouts in a game as a staff… All but three players had an RBI in game one… All but three players scored a run as well… The Hot Rods played with five infielders in the eighth inning of game one with the bases loaded… It worked to perfection with the fifth infielder (Palomaki, who was the left fielder) starting a 7-2-3-2 double play on a ground ball that ended the inning and continued the game… Bowling Green played their first extra-inning game of the season… Hollis had his second multi-hit effort of the season in game-two… Gregorio has a three-game hit streak after getting hits in both games… He was the only Hot Rods to have a hit in each game of the double header… Franco didn't play in a game for the first time this season in game one… Brown had a triple in game-two, the first of the season for the Hot Rods… The Captains will host the Hot Rods for the second game of the four-game series on Wednesday with a 5:30 PM CDT first pitch… Bowling Green will send LH Shane McClanahan (1-0, 0.00) to the mound against Lake County RH Luis Oviedo (1-0, 0.00)… Fans can catch all the action with Shawn Murnin on Willie 107.9 FM, as well as, with their smart phones via the MiLB First Pitch app and TuneIn Radio app.